"Of special interest are the data from Spitsbergen where the series of observations go back to 1912. During the first years the observations shows no conspicuous climatic change, but then comes a rapid rise of the temperature in the year 1917 to 1922. The increase of the mean temperatures in this period was about 7 degrees Celsius in the winter, 3 degrees in the spring, 3 degrees in the summer, 3 degrees in the autumn and 4 degrees for the whole year. After the year 1922 the temperature continued to rise until the war broke off the series, but the rise was much slower." Not less impressive is a further graph showing the temperature developments in Norway from Spitsbergen to Oslo during the years 1871-1938, (Manley, 1944). The image indicated the changes in the ten-yearly winter mean temperature in Tromso, Roros, Bergen, Oslo, and Spitsbergen. It is worth to observe the time of commencement of the rise at different locations, showing that the turning point was later in the South of Norway as in the North: Spitsbergen before 1920; Tromso in 1920, Roros ca. 1921-25; and in Bergen and Oslo, 1924-25. While Manley (1944) points at the fact that "Temperature in Norway, especially in the North, has certainly risen far more in recent years than at any other time in the last two centuries", Johannsson (1936) confirms that the increasing temperatures have been coming "from the North". As the 'rise' sustained for two decades, only the seas, by a substantial shift of the seawater bodies around Spitsbergen and the Northern Seas, could have generated such long-term climatic changes. This section attempts to establish that a colossal temperature rise occurred in the Spitsbergen region from summer 1918 to winter 1918/19. One aspect is official: During the last century the increase of temperatures in the Arctic was two times higher than the global average (IPCC, 2007), which is an interesting aspect but explains little. A detailed analysis needs more elaboration. The immediate problem is that there is almost a complete lack of sea water temperatures, not only from lower level, but neither from the sea surface (SST). The pillars for researching the climatic developments are surface air temperatures (SAT), and also they are rare during those days. But at least in one case the Arctic research was in luck. At Spitsbergen, the first permanent temperature data series began in 1912, right in time for recording the presumably highest temperature rise ever observed (Birkeland, 1930). Few further places within the Polar Circle provide data as well, and are now available at the website of NASA/GISS, e.g. since 1880 in West Greenland, Upernavik and Jakobshaven, and Grimsey in Iceland. In most places in the Nordic Sea area, e.g. East Greenland, Jan Mayen, and Bear Island, weather records were taken only since 1920 or later. Actually, for the first quarter of the last century, solid data concerning the polar region is limited and has to rely on few expedition records and interpretation of secondary observations. Another investigation source is, probably, the change of the ocean ecosystem, illustrated by a graph showing the great increase of the cod fishery of the West-Greenlanders since ca. 1926 (at Chapter 5), due to the higher water temperatures (Carruthers, 1941). This phenomenon in the northern North Atlantic has been subject for a number of papers since long (e.g. Lee, 1955). More recently Drinkwater concluded from such changes in fish populations occurring during the 1920s and 1930s can be linked to a general warming of the oceans, not only due to a large rise in air temperatures alone, but to an apparent change in ocean circulation that brought more warm water northwards (Drinkwater, 2006). This is an interesting and supportive material, but not the explanation needed for the way it happened. This investigation will leave the changes in the ecosystem aside and concentrate on the available temperature data. - The Barents Sea, with a modest volume (mean depth ca. 280m) but considerable size. Located at the edge of sea ice, were regardless of the time of a season at least a tiny space of the sea remains ice free, which ensures a maritime induced climatology, while a space covered with sea ice induces continental climatology. Located were the sun does not rise above the horizon for the whole winter period, at Spitsbergen from the 26th of October to the 16th of February (Birkeland, 1930). Tellus 56A , p. 328 -341, Corr. 559-560. "The influence of the Sun on the Earth is seen increasingly as one cause of the observed global warming since 1900, along with the emission of the greenhouse gas, carbon dioxide, from the combustion of coal, gas, and oil." Just how large this role is, must still be investigated, since, according to our latest knowledge on the variations of the solar magnetic field, the significant increase in the Earth's temperature since 1980 is indeed to be ascribed to the greenhouse effect caused by carbon dioxide," says Prof. Sami K. Solanki, solar physicist and director at the Max Planck Institute for Solar System Research." To find out at what time exactly the climatic changes of the 1920s started, the following discussion considers the core winter months of December to February, if not stated otherwise. Tracing the sources of 'climate making' is much easier if the sun is not involved. Without the sun heat from the oceans is the sole sustainer of the weather mechanism in wintertime at high latitude. As mentioned earlier, the information given for Spitsbergen (Svalbard) by Birkeland in 1930 was already a quite sufficient indication of the temperature shift. The change came with suddenness. On the basis of half a dozen years the jump before and after winter 1918/19 is about 8oC. Comparing only January/February of 1917 and 1918, with January/February of 1919 and 1920 the temperature jump is almost plus 10oC. During the winter of 1918/19 the temperatures varied much. There were long periods in November and December 1918 with close to zero degrees (approx. 26 days less than 5oC), with 4 days above zero in November and 7 days in December. In January 1919, on 14 days the temperatures did not reach -5oC, five days were frost-free. 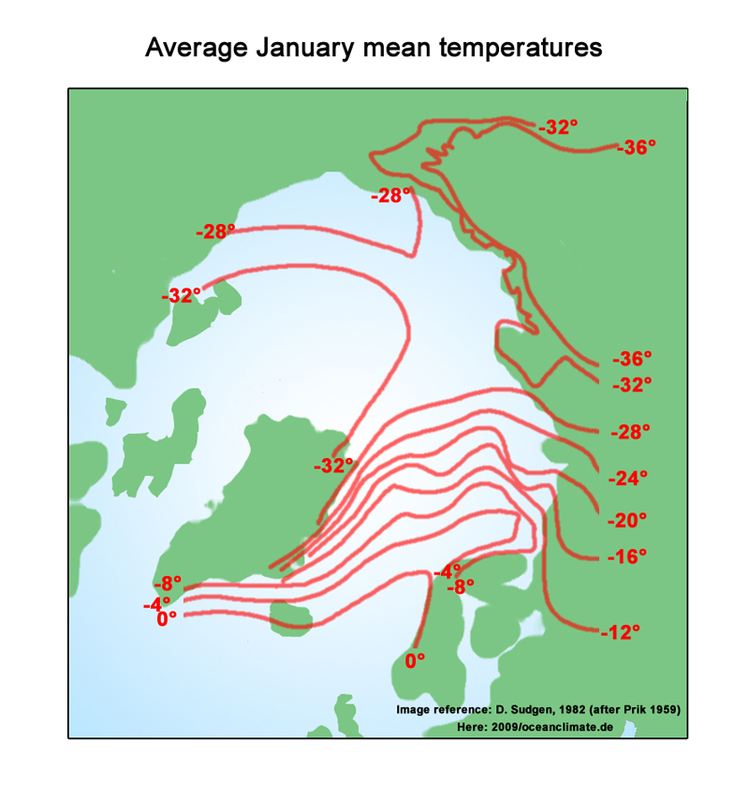 With average monthly temperatures of -7.5oC and +8.0oC, respectively, above 15-year means the sea must have transferred a lot of heat to the air. 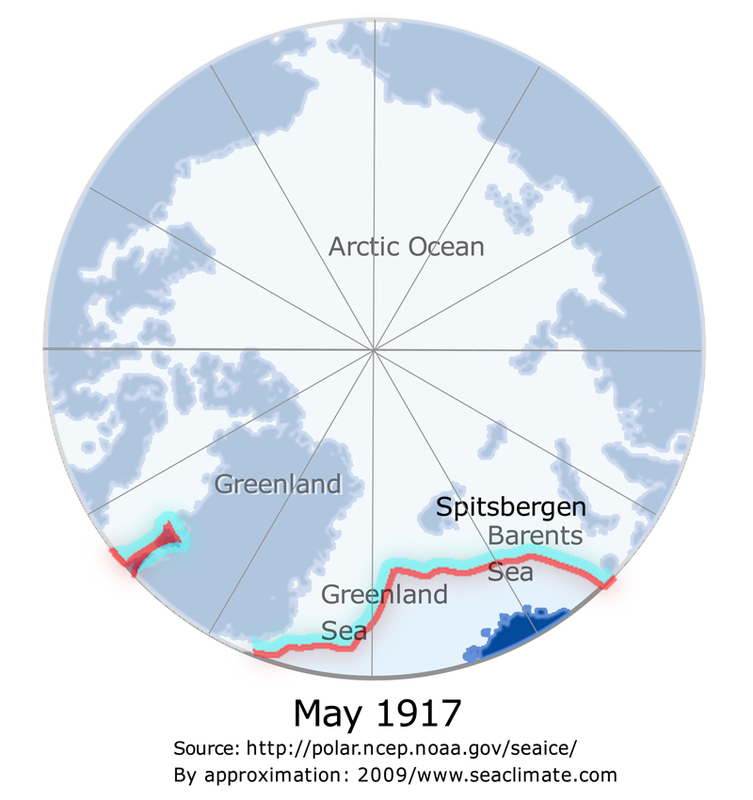 However, during February - April 1919, the temperatures were well below the average with a large ice cover far out into the sea. But that did not affect the significant warming that started a few weeks earlier. One further point needs to be observed. Actually, the 'warming-up' process must have started some months before winter 1918/19. The annual deviation for 1918, i.e. "+0.1", indicates the end of a cooling trend since 1915, during the previous winter 1917/18, sometime in spring or summer 1918. There exists even a report that during the summer 1918 the water in the Fjords of Spitsbergen west coast had been very warm, 7-8oC (Weickmann, 1942). The presented comments are an arbitrary selection and do not mention reference already made earlier with one or two exceptions. Further details will be given in the next chapter. The listing will show that the interest in the Spitsbergen event diminished over the time instead of receiving more. 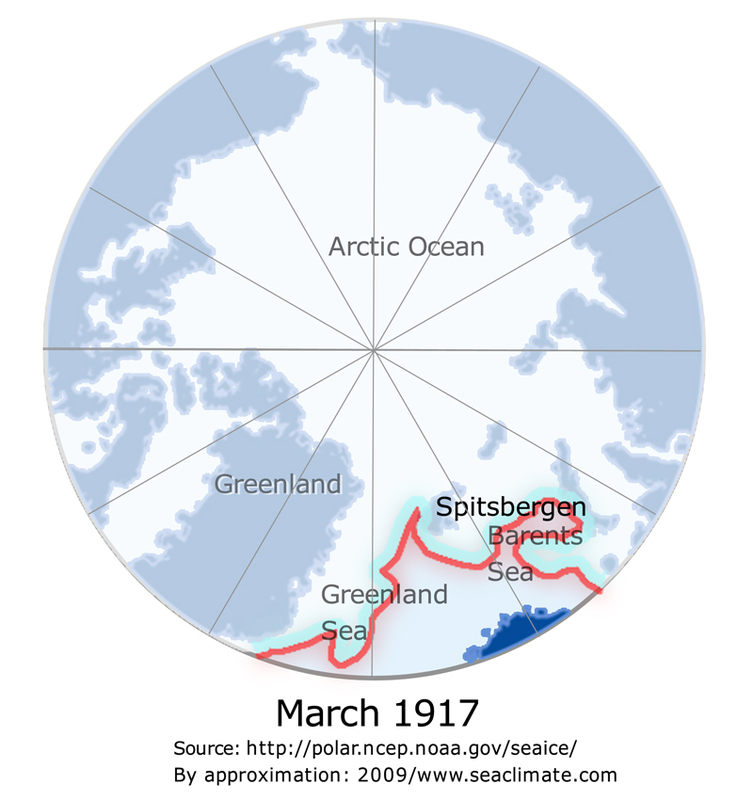 Nevertheless, it can be shown that the previous generation of researchers in earth science, might have been closer to understand the Spitsbergen event as modern science, but had been stopped by the Second World War. Birkeland (1930) The mean deviation of the Green Harbour' Spitsbergen station data results in very high figures, probably the greatest yet known on earth. Kunz (1933) Kunz dates the temperature shift at Spitsbergen to 1918, based on the winter ice conditions around Spitsbergen, noting that after the very ice-rich years of 1915-17 the subsequent years since 1918 had most been ice-poor. Schokalsky (1936) The discovery concerning the warming of the Polar Sea, which dates from 1921, was also observed by the 1928 Marion Expedition in the Baffin Bay as well as in the Barents Sea. Scherhag (1936/Sept.) During the decade 1912 to 1930 the Northern Hemisphere shows an increase in winter temperatures, which exceeds 1o north of 60oN, at the West coast of Greenland 2-3o and even more at Spitsbergen. The areas with decreasing temperatures fall aback and are restricted to middle Asia, the western part of the Mediterranean, the Atlantic Ocean between the Azores and Bermuda. The contribution to the warming in the temperate zones but particularly in the arctic region is sheer perplexing. The general situation indicates that the changes are due to an entire change in the circulation. Scherhag (1937) All stations north of latitude 55oNorth indicate a warming, which increase towards the pole, and reaching a maximum along the West Coast of Greenland with 2 degrees Celsius. However the warming is even higher at Spitsbergen. Such stipulation of temperature change as we observe at Spitsbergen, needs to be accounted as the largest climatic changes! Brooks (1938) At Spitsbergen at least, the rise occurred in two stages, the winters of 1922-23 to 1924-25 being warm, those of 1925-26 to 1929-30 somewhat cooler, and those of 1930-31 onwards warmer than the first group. Scherhag (1939/Feb) The temperature increase at Spitsbergen, which emerged for the first time in winter 1918/19, brought an increase of 5o over the period from 1912 to 1920. The warming got a phenomenal increase during the 1930s of 9o. The culmination of this development is not yet foreseeable: the winter 1936/37 was warmer than all previous records , and the winter 1937/38 broke this records as well, and was in average by 16o warmer than the winter 1916/17. There can be no doubt any longer that the temperature increase in the polar region represents the largest climatic change since regular meteorological observations are recorded. Scherhag (1939/Juni) The water temperatures in West Greenland have been remarkably low in the last two years (1937 and 1938) together with colder winters. On the contrary, nothing comparable could be observed at Spitsbergen, where the mean temperatures of the last winter (November to March) superseded with a positive deviation of +8.5oC all pervious years. Carruthers (1941) In August, 1931, H. Mosby in the "Quest" observed much higher salinities in the Atlantic water in the polar sea north-east of Spitsbergen than had been observed by earlier expeditions. Manley (1941) The effect was indeed remarkable; the salty Atlantic water penetrated further into the Arctic to such a degree that, for example, the average length of the coal shipping season at Spitsbergen almost doubled in length, from 95 days during 1909-12 to 175 days during 1930-38. Henning (1949) Before 1917 the duration of shipping to Spitsbergen had averaged 94 days but since 1918-1939 it has become 157 days. The warming moved the vegetation in Scandinavia some 100 km further north. The Meteorological Magazine, 1938, p.29-32. Kirch (1966) The world-wide rise in temperature, which began last century and has reached its climax in the thirties of this century, has been especially well-marked in the Arctic region. In the summer months, the warming was generally in the order of magnitude of 1 degree Celsius, whereas it reached 7.7 degrees Celsius in the 10 years mean over Spitsbergen in the winter months; at Spitsbergen was the annual mean of warming about 3.7 degrees Celsius. Most stations showed somewhat lower values, the main rise in temperature, however, always took place in the winter months. Lamb (1982) The change of prevailing temperatures seems to be the greatest in the regions affected by changes in the balance between the warm northbound Atlantic water and the cold polar current at the ocean surface in the Norwegian - Barents Sea - east of Greenland region. Lamp provides a graphic account of the winter temperature deviation in the decade 1921-30 (minus winter 1911-20) and with the centre east of Spitsbergen (+6oC). Lamb indicates that this region, together with the Norwegian Sea, seems to be the most sensitive to climatic variations. Jones (1982) The warming between 1881 and 1940 and the subsequent cooling to the mid or late 1960s are readily discernable. c) How does modern science talk about Spitsbergen event? The Russian scientist J. Schokalsky said to the Royal Scottish Geographical Society that " it is necessary to know more about the thermal condition of the branch of the Atlantic Current which passes round Spitsbergen". That was not last year, but well before World War II in 1935 (Schokalsky, 1936). It seems that papers published in the first decade of the new millennium are silent in this respect, and mention the extraordinary Spitsbergen event not at all, or are extreme superficial on the early warming. What is even more surprising that virtually not any efforts have been made to use the findings of the pre-WWII generation, to analyse their conclusions, or at least to make references to their publications. Their reference papers are usually not older than 10 years. Prominent names in science in the 1930s, e.g. Brooks, Helland-Hansen, and Scherhag acknowledge? Why is this a complete negative return? Do they regard themselves much wiser as their predecessor? How little specific attention is given to the location Spitsbergen shall be illustrated by few examples from well known experts. Polyakov (2003) a) The Arctic SAT (sea-air temperature) shows two maxima: in the 1930s-1940s and in recent decades. b) The warming in the 1920s-30s was rapid in spring and autumn and very rapid in winter, and much weaker in summer. 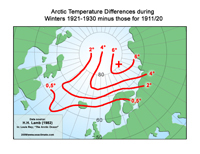 c) The period from 1918 to 1922 displays exceptionally rapid winter warming. Polyakov (2004) The warm and salty Atlantic water (AW) plays a special role in the thermal balance of the Arctic Ocean. 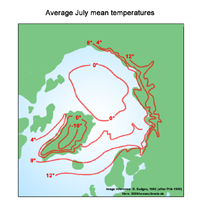 Kelly (1982) During the final years of the 1910s, warming began in the Barents Sea and Kara Sea regions. The 1920's was a transitional decade with strong warming affecting most regions. 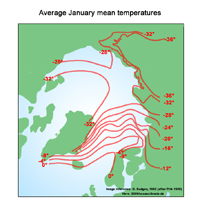 The Barents and Kara Seas had warmed by ~2oC (annual data) by the mid-1920s. The year with the most southern edge of sea ice was in 1917 with no ice free sea of the Spitsbergen's coast. The only time during the entire 20th Century. Polyakov (2004) In contrast to the warming period of the 1990s, the 1930s warm period in the Arctic did not coincide with a positive phase of the NOA (North Atlantic Oscillation). Johannessen (2004) Two characteristic warming events stand out, the first from the mid-1920s to about 1940 and the second starting about 1980 and is still ongoing. Bengtsson (2004) The huge warming of the Arctic that started in the early 1920s and lasted for almost two decades is one of the most spectacular climate events of the 20th century. Drinkwater (2006) During the 1920s and 1930s, there was a dramatic warming of the northern North Atlantic Ocean, that was considered to represent the most significant regime shift experienced in the North Atlantic in the 20th century. Drinkwater makes several references to pre WWII papers, however, his subject is the ecosystem and fishery. Overland (2005) In the early period, roughly 1920-1927, the positive phase of the Atlantic Oscillation (AO), or more locally the North Atlantic Oscillation, had a contribution on the North Atlantic seesaw with warm temperature anomalies in Europe and cold anomalies in west Greenland. Overland (2006) What is the comparison of the recent decades with the earlier warm periods in the Arctic such as the 1920s-1940s? What is the future? The story is more complex than was thought even five years ago. Serreze (2006) The earlier warming (from about 1920 to 1940) was confined largely to high latitudes. Teng, Haiyan (2006) This warming (during the last decades) is distinct from the early Twentieth century warming. IPCC (2007) Average Arctic temperatures increased at almost twice the global average rate in the past 100 years. 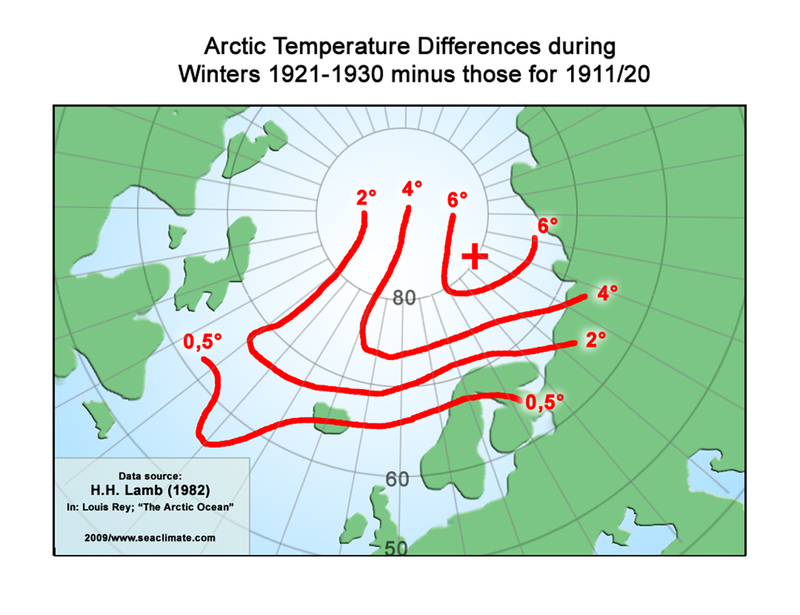 Arctic temperatures have high decadal variability, and a warm period was also observed from 1925 to 1945. Bronnimann (2008) Given the similarity of response in Arctic temperatures during the early and late 20th century warming, the question remains: To what extent is Arctic temperature controlled by global warming, by the regional atmospheric circulation, or by lower frequency oceanic processes? IPY 2007-2008 Activities : During last decades in the Euro-Arctic Region there is observed a stable tendency towards warming that enables us to assume that this is not a short-time deviation of the climatic system from the equilibrium but long-lasted changes. ...Spitsbergen is a wonderful science platform for studying the overall spectrum of reactions of Polar Regions nature on the climate variations both of natural and anthropogenic origin. C. What to make out of the big rise? On one hand there is an extraordinary and very sudden rise in air temperatures at Spitsbergen in the late 1910s, and the more time passes the less is the scientific community shows interest to scrutinize this event thoroughly and to search for clues. That is too little and insufficient. It appears that the generations of the scientist in the 1930s were more willing to take a comprehensive approach in Arctic climatic matters, and more willing making progress in this respect, as demonstrated by a sentence made many decades ago: "It has for some years surprised me that although the motions of the oceans of air and water have much in common and depend on the same principles, students in meteorology do not as a matter of course acquaint themselves with the fundamental facts of oceanography" (Carruthers, 1941). "It might appear, therefore, as if the oceanic circulation and the distribution of temperature and salinity in the oceans are caused by the atmospheric processes, but such a conclusion would be erroneous, because the energy that maintains the atmospheric circulation is to a great extent supplied by the ocean." The following discussion will pay attention to the advice. Having established that the temperature showed a rocket rise in winter 1918/19 and remained significantly high over two decades until 1940, this solid fact needs now to be analysed in its wider context and how it could be generated and sustained. 22See also: Special Page at Chapter 2, and SP (Overland, 2008) this Chapter.